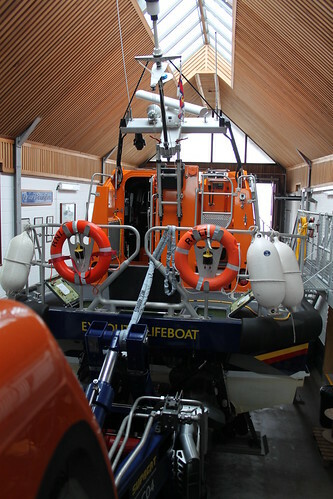 Over the last couple of weeks, I’ve been writing about the Crew’s visit to the lifeboat station down in Exmouth. In the first post, we learned about the station itself. 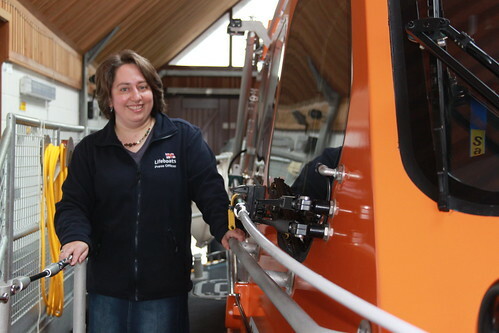 And in the second, we looked around the station’s brand new Shannon class lifeboat. But I also taunted you a little about the humungous new tractor that launches the boat. And so it’s time to turn our attention to this caterpillar-tracked behemoth. The idea of a lifeboat on a carriage pushed or towed by a tractor is not a new one. But the launch and recovery system for the Shannon takes this to a whole new level. 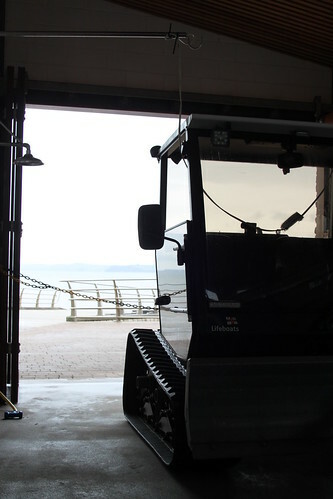 For a start, the caterpillar tracks on the carriage and the tractor are all powered, which makes the system much more powerful and manoeuvrable, so that the boat can be launched in areas that would previously have been inaccessible. 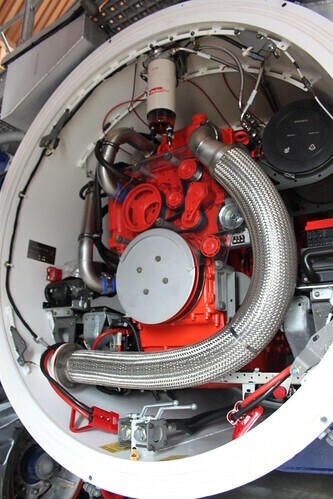 The tractor is powered by a 331kW (that’s 450 horsepower) Scania engine, similar to the ones used in the lifeboat itself. 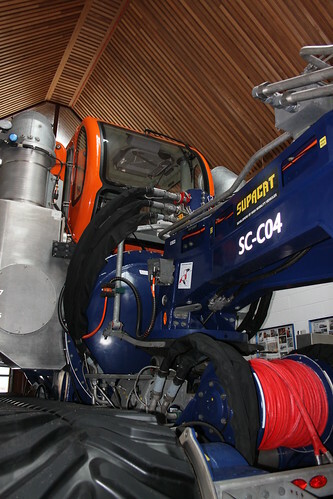 The tractor, which is built by Supacat, was designed specifically for its role in launching and recovering the Shannon. And it is completely waterproof. It can be operated in water at depths of 2.4 metres and can withstand full submersion in water up to 9 metres deep in the event of that it becomes immobilised. The Crew were massively impressed with the Shannon’s launch and recovery system. Though they felt a little overwhelmed by the size of the thing. Here are mechanic Dave and crew member Susie checking out the enormous caterpillar tracks. 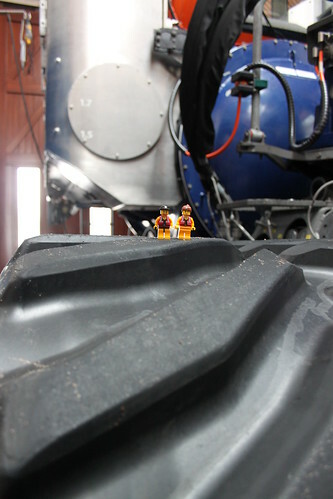 The tractor is driven from a cab high up in the air, with a view over the top of the lifeboat and to the beach beyond. 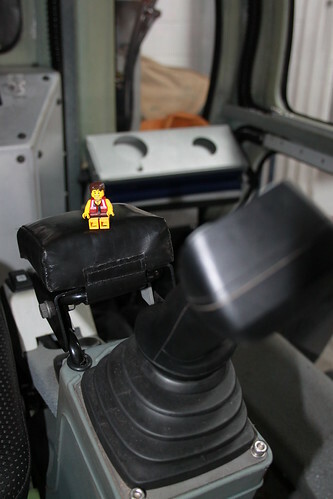 Crew member Steve took control of the tractor (very) briefly. Though I’m keen to emphasise, for health and safety purposes, that the tractor was not on and that he was supervised closely at all times. The Crew were delighted to have the opportunity to get up close and personal with the D class. Despite the shiny newness of the Shannon and the awe-inspiring scale of its tractor and carriage, the zippy little D class remains the Crew’s firm favourite. And it’s not just a little rubber boat with an outboard. 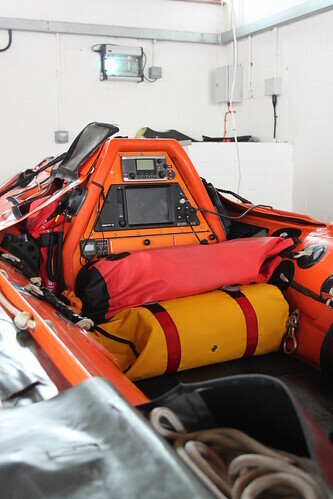 The D class is a fully equipped lifeboat that is able to operate in surf, shallow water and confined locations, often close to cliffs, among rocks or even in caves. And it can normally be afloat within minutes of the crew’s pagers going off. 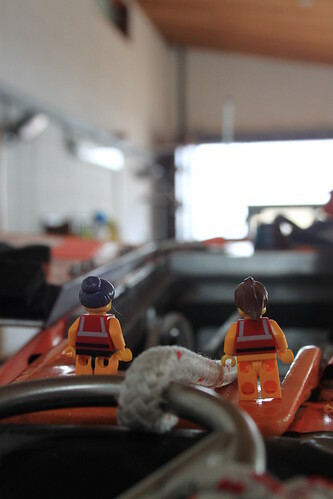 As you might have been able to tell from this and our previous posts, the Crew had a great time visiting the lifeboat station at Exmouth. They and I learned a great deal about the boats and about what makes the station tick. And that’s due in no small part to the knowledge and enthusiasm of Emma Tarling, the station’s extremely hospitable (and very patient) press officer. So a big ‘thank you’, Emma, for making our visit to special!